Really enjoying all the feedback on my “How to Become a Firearms Instructor” article. There’s so much more to say and to think about with the topic. What makes a good instructor? What credentials should a firearms trainer have? What kind of background? What isn’t necessary? If you haven’t figured it out, I really do have a heart to help other people—women and men alike—reach their full potential both as shooters, and as people who want to protect themselves and their loved ones. Because there’s such a great need, I’m especially excited to help other instructors get where they want to go. So I’ve been thrilled with the comments on the blog and with the emails I’ve exchanged with others who found the article thought-provoking in some way. I had only been shooting a short time and wasn’t very skilled when people pushed and pushed me to become an instructor. “We need more women in the field” they would say. These people were kind and sincere and being encouraging. Most saw something in me and thought I had the ability to do a good job and wanted me to get the certs and move in that direction. No one was being casual or flippant, but still, what we need is more skilled and qualified people in the field not just more people, male or female. That’s a song all too many women could sing along with. And it leads into something else I’ve been thinking about for awhile. But first, let’s make this post a little more fun by throwing in an awesome video I picked up from Tamara’s blog the other day. Yep, that’s a dog. Driving a car. Admittedly, he doesn’t drive the car very well. And his parking job stunk. But still! It’s a DOG. Driving a CAR. How cool is that? Where were we? Oh, yes. Women, firearms training, instructor stuff. For some time now, I have been aware of an—I’d call it an undercurrent, but it’s more like an undertow—in some parts of the gun world. It’s this thing where we really don’t expect much from female students. Or anything at all, really. We’re just thrilled when a woman steps onto the range with us. That’s victory enough! She doesn’t have to be very good, or try very hard, or learn anything. We’re happy just to have her there. Wait, let me back up a little. I’m still thinking about that dog and his parking job. 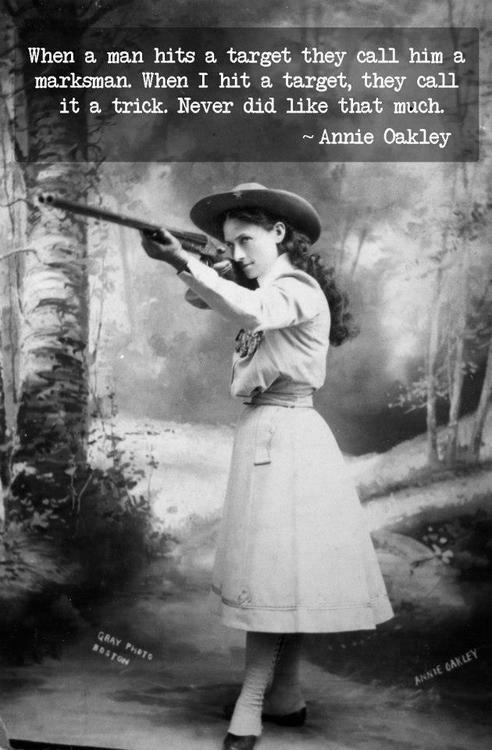 Women in the firearms community have too often been that bear. We’ve too often been a dog, driving a car. Not very well. But still being awesomely cool because … well, because it’s a GIRL. Shooting a GUN. How cool is that? Not that this is news to anyone, but of course there’s a little history in play. For many years, firearms belonged to the guys. Instruction in gun use was passed down from father to son, from uncle to nephew. Generations of old men taught young men how to hunt. Adult men exhorted boys to learn the manly art of self-defense, so that they could protect their wives and their daughters from evildoers. The occasional woman who wandered into the serious shooting world—there were plenty of them in absolute numbers, but relatively few in proportion to the number of men—was an unexpected anomaly. 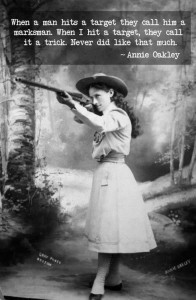 During these years, “You shoot pretty well … for a woman” was not an insult. It was a compliment. Image courtesy of Oleg Volk. Used by permission. So here’s where I ask: Have things changed that much? We’ve come so far—but have we come far enough? When I heard this man saying that, I drew in a big gulp of air and prepared to let him have it with both barrels. But before I could launch into my diatribe—how sexist! How unfair and untrue!—I heard a little whisper of doubt in the back of my mind. Is it true? 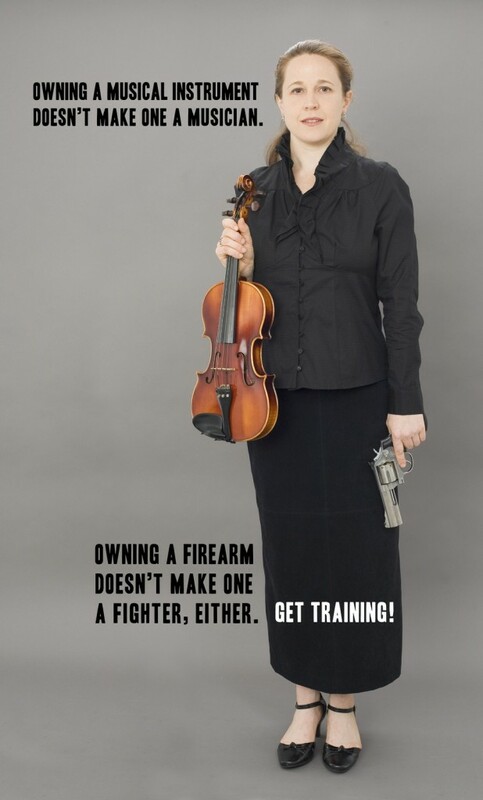 Arewomen really serious about learning how to use firearms effectively? Am I fooling myself to bet my livelihood that I could find enough people who would take their training seriously, and who would be willing to hire a woman to teach them how to defend themselves? Not long ago, I was talking on the phone to one of the big names in the firearms instruction industry. (Nope, I won’t tell you who it was. Is that better or worse than outright name-dropping?) Anyway, this person was telling me that I’d never get any respect in this industry if I just stuck to teaching women’s classes. “There’s no credibility in teaching women,” he said. A few weeks back, I walked into a gun store. This wasn’t one of my usual haunts. I was by myself and just killing a little time. When the sales guy came over, I said, “I’d like to take a look at that handgun, please,” and I pointed at a very nice .45-caliber 1911 behind the counter. He immediately replied, “That’s a big firearm for a new shooter. We usually recommend our newer shooters start with—“ New shooter? Why am I a new shooter? Oh, right. I remember now. Here’s the rule: all women are always new shooters, unless they say otherwise. I gently corrected his assumption, and we went on to have a good conversation. Seen in that light, big name instructor dude’s comment makes more sense. There’s no credibility in teaching women’s classes, because women’s classes are, of course, classes for beginners. Always and only for beginners. The most beginnerly of beginners, at that. They surely involve a lot of weepy handholding and other gurl stuff, and they simply cannot be serious training for serious people. We know that because hey! girls are involved. Duh. I had only been shooting a short time and wasn’t very skilled when people pushed and pushed me to become an instructor. “We need more women in the field” they would say. We do need more women in this field… lots of them. The industry has suffered, and suffered badly, from the lack of female participation in years past. That lack has too often shortchanged female students, and, in the past, it scared away or crushed the excitement out of a certain number of women who should have become today’s leaders but who went off and did other things instead. To avoid repeating the firearms training industry’s past mistakes, we need more women in this field. But more than that, we need more competent people in this field. People who are willing to take themselves and their training seriously. People who feel the full weight of an instructor’s responsibility to her students, and who willingly shoulder that burden because it needs to be borne. Honest people who never pretend to be more than they are or to know more than they do. People who will do the hard work that it takes to get where they want to go. People who will not cheat new shooters who happen to be female, by being too afraid of their wimpy female nature to teach them what they need to know. People who take the job, and their students, seriously. The tragedy is, I think the temptation to become a Dancing Bear can be pretty strong. When people look up to you just for being, it takes some strong character to do the work that needs to be done. It’s easier to just shuffle your feet a little, and let the crowd call it a dance. Women do often get pushed into positions of leadership at their clubs and ranges, positions they themselves know they aren’t quite ready to take. But don’t turn those positions down because of that! Instead, take a look around—there are a lot of brand-new shooters coming up behind you, people who know even less than you do right now. These new folks need role models and encouragers and yes, teachers. They need people to look up to. Can you step up and become that person, even if you aren’t there yet? You betcha you can! Will it take work? Certainly. But it’s joyful work, and it’s work that needs to be done. Because we don’t need any more Dancing Bears. Or dogs driving cars … badly. Note: if you’d like to comment on this article, please visit The Scratching Post and leave your feedback there. Thanks!